By the mid-1990s zydeco artist C.J. 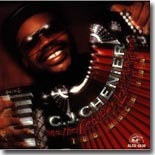 Chenier had already been taking over the legacy of his father Clifton Chenier, the undisputed King of Zydeco, after the elder Chenier’s death in 1987. His band at the time included zydeco veteran Harry Hypolite, who also played on many of Clifton’s recordings. Chenier had released several successful albums on the Arhoolie and Slash labels after his father’s death before moving to Alligator Records in 1995 with the successful release of Too Much Fun, an intriguing blend of traditional zydeco and contemporary sounds. Also on board for this album were The Memphis Horns, adding a heaping measure of soul with their in your face brass. Chenier covers three of his father’s standard numbers (“Zydeco Cha Cha,” “You Used To Call Me” and “Louisiana Two Step”) but breathes new life into these zydeco classics. “Zydeco Cha Cha,” which has been covered by many other artists, features a lot of extra percussion instruments mixed in to make it one of the better versions I’ve heard. The album opens with one of the more interesting tunes, a cover of the calypso standard “Man Smart, Woman Smarter.” Chenier spins it enough to fit it right into the zydeco genre. He also puts a unique twist on Z.Z. Hill’s “Down Home Blues,” with the words sung in Cajun French; it’s re-titled “Louisiana Down Home Blues” for this album. The horns really get a chance to shine on the funky blues original “Squeaky Wheel,” which also gives Chenier a chance to show off some red hot accordion licks. Closing out the disc is an extra hot version of the aforementioned “Louisiana Two Step.” It’s very traditional sounding, and very upbeat and red hot. I have to think that Clifton would have been extra proud to hear his son’s version of his classic. C.J. Chenier went on to record two more albums for Alligator, the 1996 disc Big Squeeze and 2001’s Step It Up!, but very little in the last decade. That’s a shame because there’s a lot of good music here. It’s still available, so be sure to add it to your collection if you don’t already own it.